We’re from Chicago, where Garrett is the gold standard in fresh popcorn. The enticing smell of Garrett wafts up and down State Street. Every batch is handmade throughout the day, so your popcorn is always hot. At 5pm, the line for popcorn goes down the sidewalk, as the after-work crowd times their commute with a stop to grab a bag for the el ride home. The hottest commodity at Garret is the Chicago Mix, a combination of CaramelCrisp and CheeseCorn. Yes, in the same bag. Don’t wince, it’s a Chicago thing. This is all by way of telling you that we are a tough audience. Popcorn, we know it. So we stopped by Vic’s, and it’s a winner. If you love popcorn, whether you are a popcorn purist or a lover of flavored popcorn, they’ve got it. 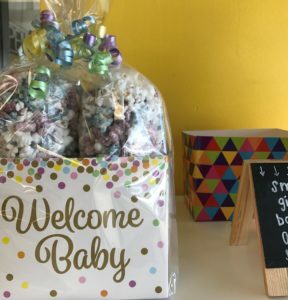 Start with one of their most popular products, the Midtown popcorn mix, regular salted popcorn and sweet Confetti popcorn. 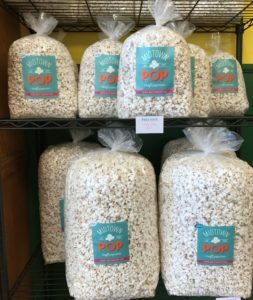 Established in 1987, Midtown Pop – formerly Vic’s Corn Popper – is Wilmington’s popcorn empresario. Get your popcorn savory, or get your popcorn sweet, it’s guaranteed popped and packaged right then and there. The Midtown Popcorn crew arrives an hour before the store opens, and starts popping. The flavors range from caramel chocolate, pink cotton candy, Kettle Light (made with Truvia), and Sea Salted Caramel, to tempting savory flavors that include made-to-order BBQ, Ranch, and Sour Cream and Onion. There’s also a Port City Cheddar seasoned with Old Bay. The Midtown popcorn crew will custom mix flavors for you, and prices start at $1.35 for a small bag of regular salted or unsalted popcorn, to a party size bag of specialty flavors at $83.99. The party size bag approximately 300 cups of popcorn, so the question is simply, how much popcorn can you eat, because they can pop it. If you’re ordering big, Vic’s will also custom mix colors, so you can celebrate a team, match wedding colors, or match your interior decor. Just a suggestion … popcorn has been known to escape. We asked for a suggestion on the most popular popcorn flavor, so we went with it, and our Midtown Mix was mixed and bagged while we waited. 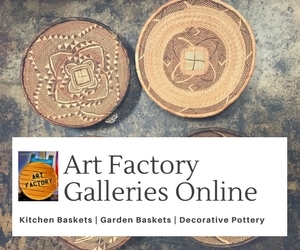 It’s pretty addictive. Satisfies that crave for a salty snack, and that sweet tooth. The popcorn is absolutely fresh, and there are no distracting kernels, so they definitely pop it better than we can at home. We also grabbed a bag of cotton candy from the shelf: super fresh, not overwhelmingly sweet, and delightfully cotton candy flavored. And a bag of butter pecan crunch. Super good. When you stop in, look for their special popcorn flavors, too. 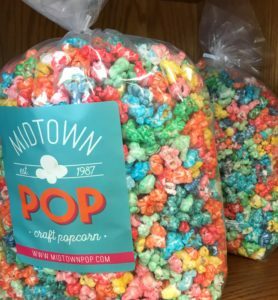 We were told that Midtown popcorn does a little experimenting on a weekly basis, so you never know what you might get to taste test. Today, it was Dill Pickle. Yes, we’d buy it again. 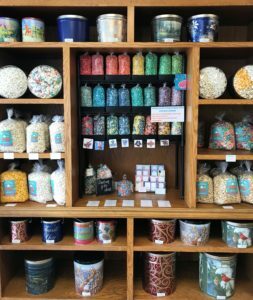 Other things to look for: gift packages, butter pecan crunch mix, and tins that are great for packing up to send a little of Wilmington’s best popcorn. Like maybe, back up to Chicago.